The Mediterranean area with its mild climate represents an ever changing landscape of high mountains, rocky shores, impenetrable scrub, pine forests, semi-arid steppes and coastal wetlands - forming the habitat for a wide diversity of animal species. This carefully selected nature ambience library features fresh recordings from these rich sounding places and reflects the mediterranean nature in all it's diversity and beauty. With a lot of effort we managed to find these rare remote areas where it was possible to only capture pure nature free from any civilization noise. To spice things up the library also includes a couple of exceptional The greater part of the recordings were captured on the beautiful island of Corsica in France and the Lycian coast of West Turkey. Furthermore there are recordings from South Croatia and Corfu in Greece included. This library contains over 50 sound files, most of them recorded in discrete 5.0 surround with our wide spaced surround rig equipped with 5 omnidirectional Sennheiser 8020 microphones. 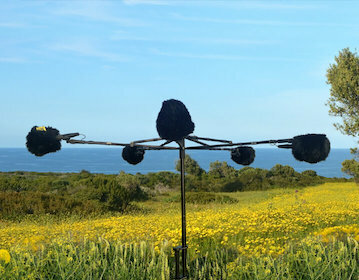 This rig features a wide and lush sound field with maximum time of arrival effect, which to our extensive testings gives the most satisfying results for cinematic sound design. Because of the wide spaced distance of the microphones the sounds also mix down nicely to stereo and also work perfectly for TV, games or headphone setups.The stereo versions as well reflect the ear pleasing widnes of the 5.0 recordings. To spice things up the library also includes a couple of exceptional stereo only recordings which were recorded in situations the surround rig was not at hand. This rig features a wide and lush sound field with maximum time of arrival effect, which to our extensive testings gives the most satisfying results for cinematic sound design. Because of the wide spaced distance of the microphones the sounds also mix down nicely to stereo and also work perfectly for TV, games or headphone setups. The stereo versions as well reflect the ear pleasing widnes of the 5.0 recordings. To spice things up the library also includes a couple of exceptional stereo only recordings which were recorded in situations the surround rig was not at hand of the 5.0 recordings. To spice things up the.